Walsine Pierce: NOW I KNOW: Won't eat there again! A SHORT BLOG! Yes, I really can write a SHORT blog. Julie left work early today and we had a mid afternoon lunch. I suggested going to a new burger joint that opened in the area last summer. 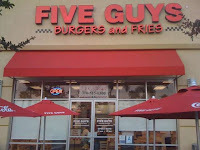 It was called FIVE GUYS. Julie said she heard it was expensive. As always, I said we should try it ourselves and make up our own mind. We both had a cheeze burger and split fries. Julie had iced tea and I had a diet coke--both medium. (Free refills, why buy anything but the smallest?) They gave us a number and we had to wait. THE BILL, THE BETTER PART OF $17.00. Yes, $17.00! We are Wendy people. For less than $7.00 we buy two baked potatoes, two double stacks, a small chili and a frosty. We get it to go as we have cases of soda at home. Even worse, for $11.00, including drinks, we could have had a first class meal at Chipotlies. Like beauty, taste is in the eye, or in this case the mouth, of the beholder. On a 1 to 10 scale with 1 being the worse and 10 being the best, FIVE GUYS CHEESEBURGERS were maybe a 3, no more than that. Wendy's double stack, for $0.99 is a pretty good burger, maybe an 8. We got a clue with all the signs in FIVE GUYS telling us how good it was. The sign was reinforced with the clerk's constant rave about the quality of their burgers. NOW WE KNOW. As Julie said, we've seen our duty and we've done it. We sure won't do it again. Wise Woman.